When the cold gets too unbearable, a little bit of summer dreaming can be just what the day demands. And what better way to ditch the seasonal chill than some dream-worthy above ground pools ideas that will help create your own backyard oasis? 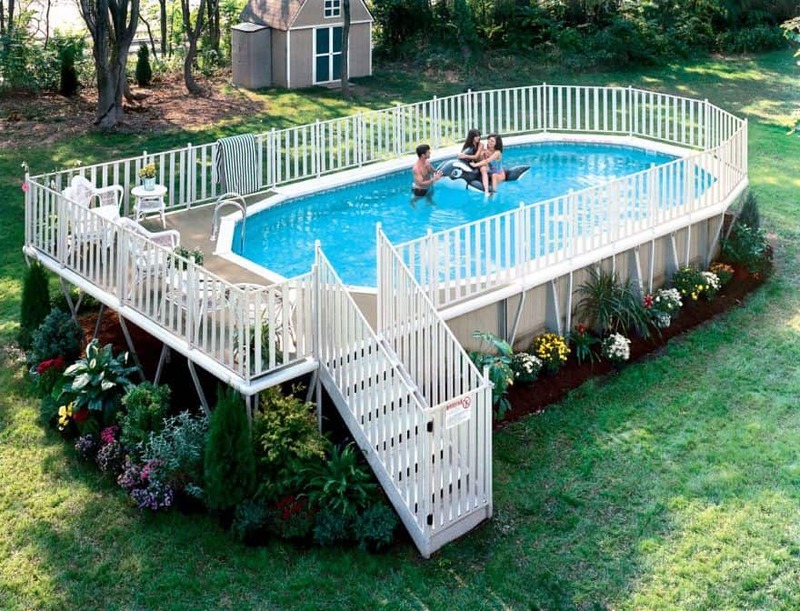 Many of us have to travel for that luxury, but a lucky few have a backyard and can build their own private dream pool. 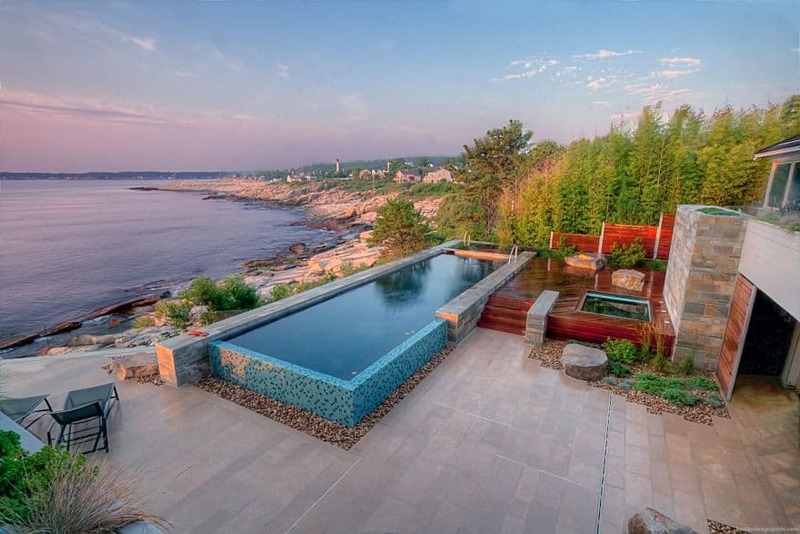 If you’re considering adding a backyard swimming pool and the classic, rectangular ones don’t fit your taste, consider these above ground swimming pool designs and ideas that can really add character and intrigue to your pool, as well as to your entire landscape. 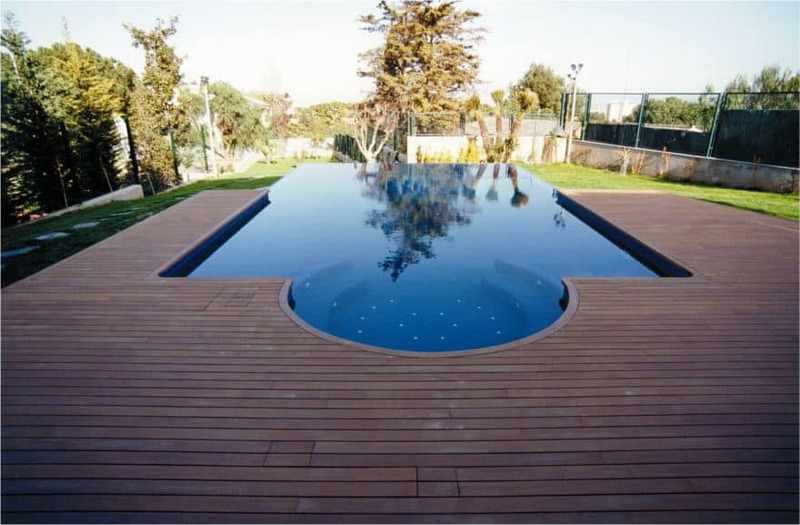 • they are easy to install – you can get an above-ground pool installed and ready to use in a very short period of time. 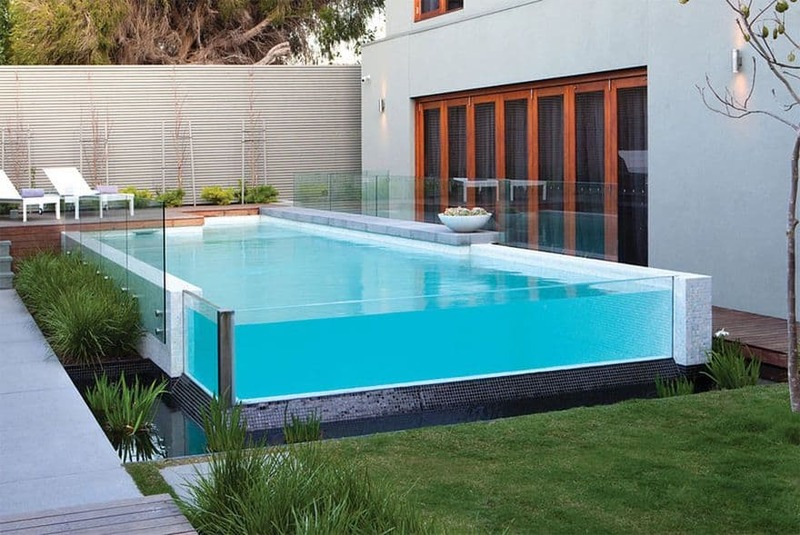 • ease of maintenance – the process of cleaning and maintaining above-ground pools is also easier because nothing is hidden and all the parts are easily accessible. • they have the same features as in-ground pools – today’s above-ground pools are equipped with slides, water fountains, waterfalls and more, making your swimming experience that much more enjoyable. 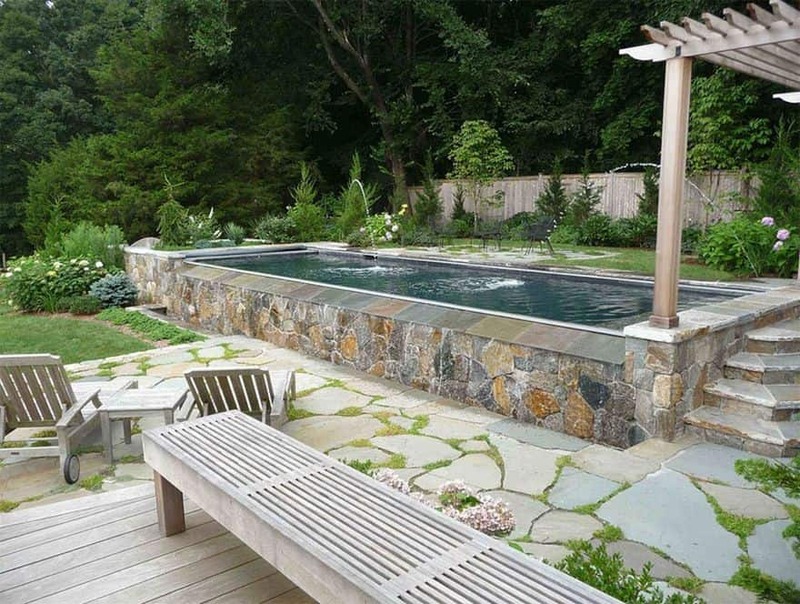 • above-ground swimming pools can be a relaxing yet surprisingly affordable backyard luxury. If you like the idea of having your own dream-worthy swimming pool but you’re on a tight budget, above-ground pools are the perfect solution. Not only are they cost-effective, they’re more attractive than ever! There are plenty of add-ons available on the market, luxurious items that are usually associated with in-ground installations and can enhance your outdoor swimming area in no time. Adding some features like above ground pool decks, comfortable outdoor patio furniture or lighting fixtures will improve the look and functionality of your swimming pool, helping you to create the ultimate backyard paradise. 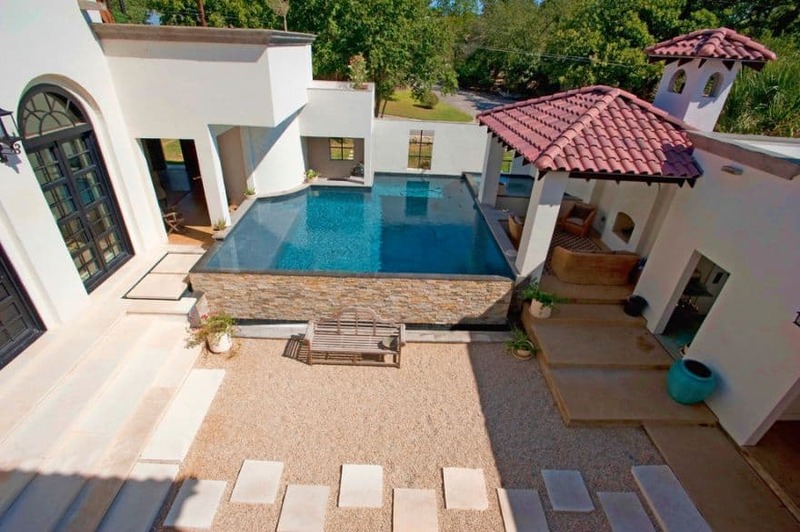 If you think an above-ground pool is right for your needs, check out these creative ways to add some style, maximizing the enjoyment factor out of your outdoor living space. 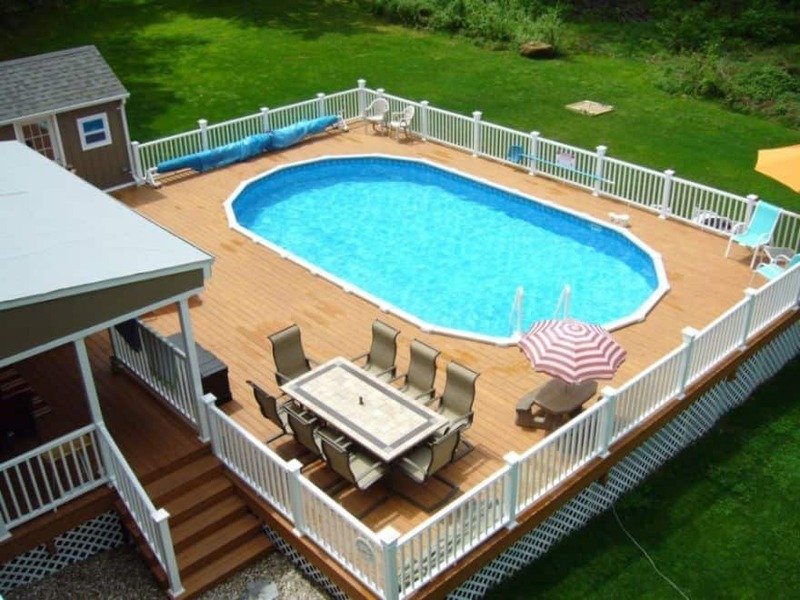 Installing a deck around the pool will give you an easier way to get in and out of your pool and extra lounge space, while hiding any unsightly elements. 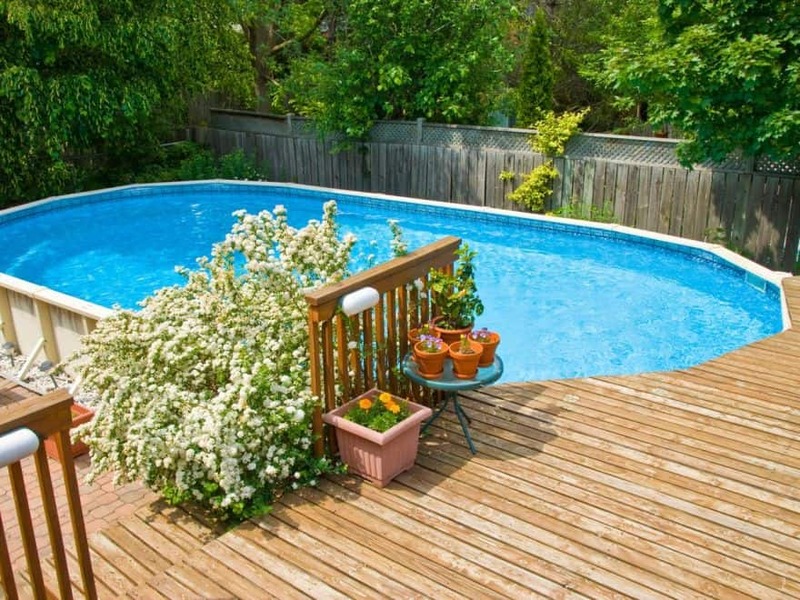 Built-around decking is a great way to improve a pool’s appearance. 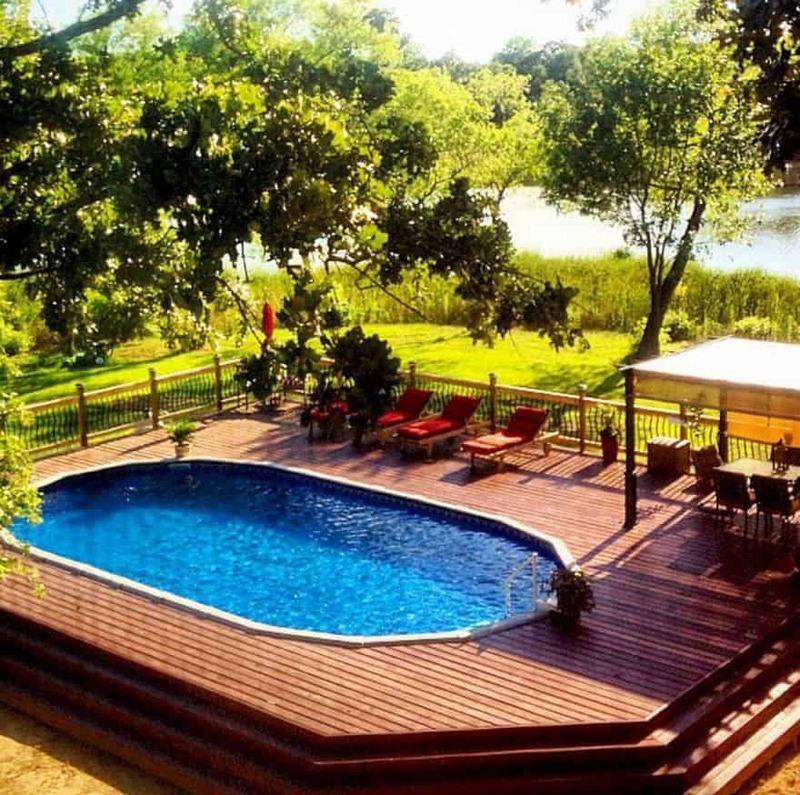 A deck can turn your pool area into an oasis in the courtyard, a fun-in-the-sun gathering place for family and friends. 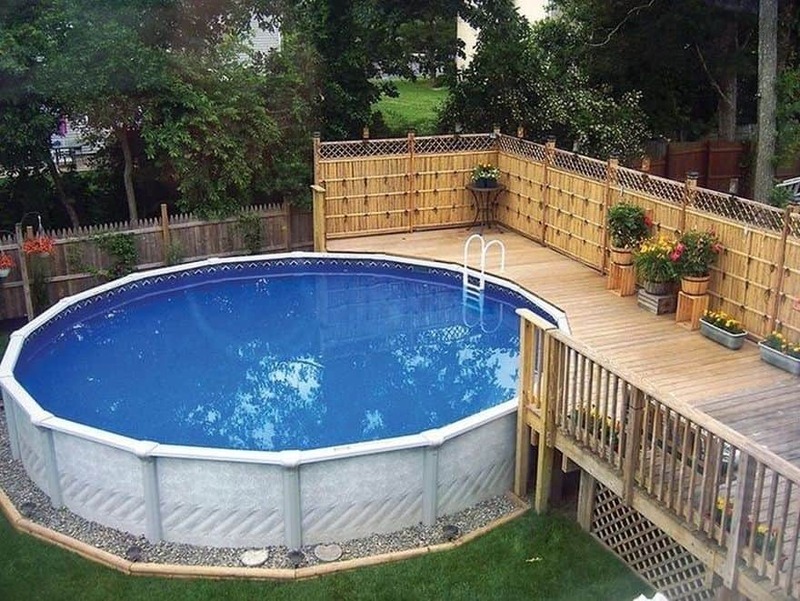 Shape, size, construction materials—there are so many great options to choose from when you build an above-ground pool. 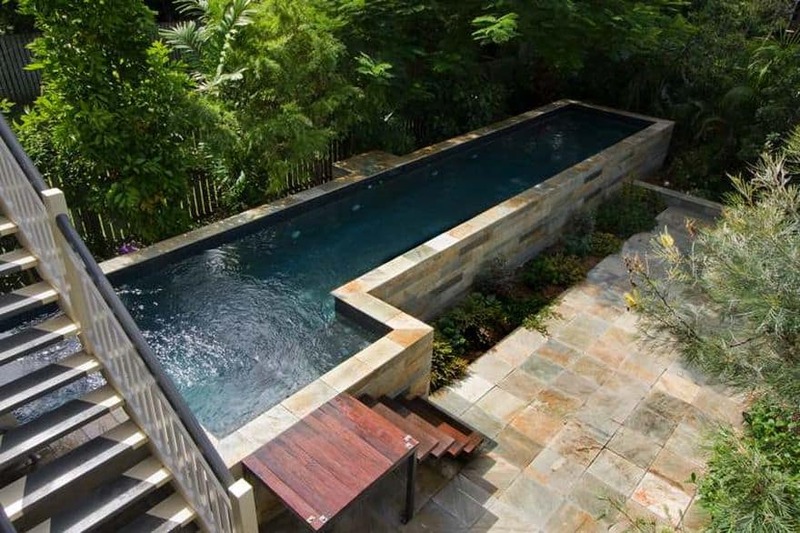 Even though above-ground pools are a “budget” option, with careful design planning and the right finishing materials they can make a truly beautiful conjunction with your outdoor space. By adding some high-end features like glass or ceramic tile to your above-ground pool you can create your very own aquatic paradise. 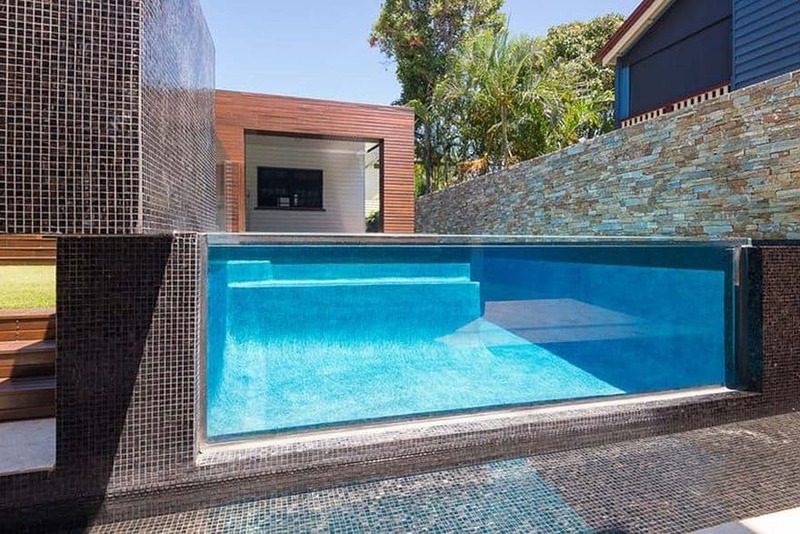 When most people think of the ideal pool, they think of an in-ground swimming pool, but with pool manufacturers and installers offering new shapes and surround designs for above ground pools you’ll get the same feeling of luxury.